Your question about repentance is timely, as Brad, myself and several other brothers here in Logan have been discussing it at length. We recently discovered an outstanding little book on the subject written in the late 19th century, which you must get your hands on. It's called "The Great Meaning of Metanoia" by an Episcopalian minister named Treadwell Walden. He wrote it about a month after the Revised Version of the Bible was published, which was anticipated to be a corrective translation of the traditional English version (KJV). Unfortunately, the Revised Version left untouched the word "repentance", and Walden wrote to express his disappointment. Scholars who worked on the Revised Version and other New Testament professors wrote to Walden expressing their support of his position, admitting that the word "repentance" is a bad translation of "metanoia", for it doesn't carry the word's meaning at all. Walden's original essay is brilliant and full of apostolic character which is often so lacking in traditional Christianity. The book is out of print, but the University of California Library prints it on demand for somewhere between $15-$20 dollars (here). I think it is worth every penny. Simply put, metanoia is a word filled with remarkable meaning by the preaching of Christ and the apostles. It is not a word that comes replete with it's own meaning. The English word "repentance", on the other hand, comes filled with it's own meaning - it needs no supplementation by context. Repentance means to feel remorse or regret for your sins; it's Latin root literally means "pain; suffering in view of being liable to punishment". Metanoia has no such meaning associated with it. The word is Greek, and it is made up of two words: meta & nous. Meta means "after" or "change", and nous is the Greek word for "mind". The word means "after-mind" and signifies a change of mind: thinking one way, but then afterwards thinking another. It is the opposite of pronoia (pro-nous) which means before-mind: the mind or thinking you have before. Interestingly, there is another Greek word we frequently use in English that is related to metanoia: it is paranoia (para-nous). Literally, the word means to be beside-mind, or we would say "out of your mind", or "beside yourself". Paranoia is not being in a right mind, but having a mind that is off center - that is, not where it should be (http://www.etymonline.com/index.php?term=paranoia&allowed_in_frame=0). If you compare metanoia and paranoia together, you get the idea of what the New Testament call for metanoia is: it is a command to change your mind and get it where it should be. Of course, metanoia, when used as a command ("change your mind") needs supplementation by context; it needs to be filled with more information because we need to know what we are supposed to change our mind about. It can be something small (metanoia about how to spell "judgment"), to something enormously large (metanoia about your religious worldview). The sky is the limit with metanoia, and that is precisely the point of the remarkable function of the word in the New Testament. It is not restricted, like "repentance", to a narrow meaning of pain and sorrow for sin, which we then have to force unnaturally to fit with the gospel. It is a change of mind unto the gospel itself. The gospel is what the change of mind is about. The preaching of Jesus and the apostles speaks to the nous and men change or don't change their mind as they hear it. When a man changes his mind at the preaching of the gospel, he has experienced metanoia. Thus, the proclamation of metanoia at the beginning of the New Testament is the doorway into the entire rest of the doctrine of the New Testament: Change your mind! About what? Listen! A radical mindshift in the religious world is about to happen... no, it is happening now... What we thought about God and the law and righteousness and forgiveness is all about to change. Hear! Metanoia and believe the gospel! New Testament metanoia is a divine call to a radical mind-shift in the way men think about religion. Therefore "repentance" is an entirely unsatisfactory translation of the amazing word "metanoia" which gives a completely different feeling to the preaching of Jesus and His apostles. Was the major proclamation of Jesus and the apostles "Repent! Feel sorry for your sins"? Or was it "Metanoia! Think a new way"! Do you see what a difference these two words make? Which one is in keeping with the gospel of grace as we know it from the New Testament? Not the first, but the second. The gospel calls us to a new way of thinking about religion. Whereas men think that they are good, and that obedience to the law is the way of salvation, and that the law only requires partial obedience, and that most people won't perish, Jesus calls us to believe that there is none good, and that no one will be saved by obedience to the law, because the law requires perfect obedience, and that broad is the road that leads to destruction. 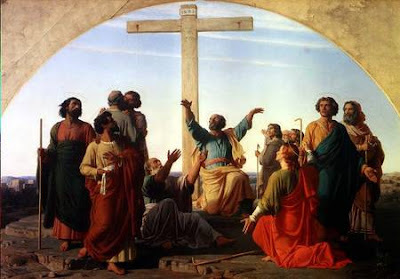 The apostles call us to believe that the cross of Christ is the power and the wisdom of God, the only way whereby we are saved, and live, through faith, while the world thinks that the cross is foolishness. Which word best summarizes this kind of preaching: "repent", or "metanoia"? Certainly not the first, but the second. How did we lose this apostolic feature from our understanding and preaching of the gospel? Our loss of the meaning of metanoia came from early Latin Christianity, which failed to comprehend what was happening in the New Testament. It failed to understand the meaning of the gospel of grace, and envisioned Christianity to be primarily concerned with amending men's behavior - in which Jesus, the God-man, came to teach men the highest principles of piety and morality. In keeping with this sentiment, the Latin Vulgate made the colossal error of translating "metanoia" as "poenitentiam agite" (do penance). But how could they do this, since the two concepts are so radically different? It is because the early Latin scholars, who indeed recognized that the Greek word "metanoia" meant to "change the mind", did not understand what the New Testament gospel of grace was all about, and consequently, since the word is hollow and requires filling, they filled the word metanoia with something other than what Christ and the apostles filled it with. They interpreted the mind-change as changing your mind about how you are behaving - to regret your sinful lifestyle and to amend your life, rather than as changing your mind about the way of righteousness - that righteousness does not come through the law but through faith in Christ. Having interpreted the call to change your mind this way, the Latin scholars thought it would be more helpful to skip the more hollow word "metanoia" with the fuller paraphrase "poenitentiam agite", which they believed best communicated the purpose of the mind change. Thus they paraphrased the word metanoia as they thought best; they did not translate the word. And it stuck. The Latin Vulgate possessed sole and unquestioned authority for over one thousand years, and therefore this erroneous paraphrase, "peoenitentiam agite" (do penance), became deeply rooted in the Church's vocabulary and teaching. By the time of the Reformation, the doctrine and practice of penitence ("repentance") was so assuredly believed to be Biblical that even the Reformers could not see clearly enough to root it out of their own systems. Though they rightly saw afresh that the gospel of Jesus Christ was all about righteousness through faith apart from works, they continued to confuse "metanoia" with penitence, and the rest of Protestant history has been an awkward and uncomfortable effort to somehow fit the necessity of repentance alongside the proclamation of sola fide. The proposed solution to the problem was to move repentance from one side of salvation to the other; so that, instead of having to repent in order to be saved (as the Roman Catholics saw it), the Reformers argued that repentance was a fruit and effect of being saved. In this way, salvation produced the amended life, but was not dependent upon it, so preserving the gospel of grace. However, while it indeed is true that salvation produces the transformed life and not the other way around, the Scriptures remained clear that Jesus and the apostles preached that in order for men to be saved, they must "metanoia" (ex. Luke 13:3, Acts 3:19, etc.) - and the real problem was not in the order of salvation and repentance, but in the word "repentance" itself. The Roman Catholics understood the order correctly, but had the wrong definition of metanoia, while the Reformers understood the order incorrectly, and likewise had the wrong definition of metanoia! This incorrect order and definition has caused the strange unapostolic juggling of sola fide and repentance within Protestantism, a juggling we have has seen for the last 500 years, and which is still just as prevelant today. All that is needed for the juggling to stop is to simply see the true meaning of metanoia. Notice the juggling that takes place in this explanation of "repentance". Repentance is not to be rested in as the cause of our salvation, but yet you dare not rest unless you have repentance! Repentance is necessary for the sinner, as well as faith in Christ! This is simply unbiblical and unevangelical. It does not carry with it the free and gracious character of the New Testament gospel, but rather attaches to the free offer of the gospel an awkward and burdensome system of penance - that residual vestige of old Latin theology. The Reformers, while seeing correctly that righteousness comes by faith alone in Christ alone, failed to see the beautiful meaning of metanoia. Metanoia is but the change of mind to this gospel, and it is the call for men who are ignorant of the righteousness of God by faith to see this new and living way of righteousness in Christ and the futility of their own attempt to be righteous by the law. But the Reformers, unable to see past the deeply entrenched Latin concept of poenitentiam agite to the original apostolic meaning and preaching of metanoia, were left with nothing else to do but juggle awkwardly in order to be faithful to Scripture and to preserve the gospel they had come to see and love. It would be helpful to ask any Reformed Christian if they have "repented" according to the definition of the Westminster Confession of Faith. Have they "turned from all their sins unto God, endeavoring to walk with Him in all the ways of His commandments?" Have they "repented of their particular sins, particularly?" And if not, does this mean that they are not saved? Of course, they will admit that no one has, but experience has typically shown that rather than admit the Confession is wrong, the standards get lowered so that people can feel like they have repented. If we don't lower the standards and are honest about our sins, we will admit that none of us truly feel sorry for all our sins, and none of us have turned from all our sins particularly, nor do we obey all the commandments. If we did, we wouldn't be sinners! But the gospel is the good news for sinners, that as sinners, we are "justified freely by His grace, through the redemption that is in Christ Jesus" (Rom. 3:24) through nothing but faith alone. "To the one who does not work, but believes upon Him who justifies the ungodly, his faith is counted unto righteousness." (Rom. 4:5) Reformed churches believe this! Why not then drop the the erroneous and awkward doctrine of "Repentance unto Life" for the Scriptural and apostolic doctrine of metanoia unto life? "Whosoever will, let him take freely of the waters of life." (Rev. 22:17) "'Sirs, what must I do to be saved?' And they said to him, 'Believe on the Lord Jesus Christ, and you shall be saved." (Acts 16:30-31) "The Lord is... not willing that any should perish, but that all should come to metanoia." (2 Pet. 3:9) God calls sinners to eat freely of the bread of life, the broken body and shed blood of His Son. This is a meal He has set for the ungodly, not for the righteous nor for some phony level of righteousness. He wants sinners to eat of it, and He does not set up signs that say: "Only for those who are penitent". God sees our dire need and says, "Eat, sinner, and live! Believe on the Lord Jesus Christ! Look and your soul shall be filled! Do not think that you must worthy to receive My salvation. Behold and believe My righteous generous grace for you displayed in the cross of Christ. Metanoia!" I may or may not have met you a some years ago. The other night, I was thinking about some people from back in the day and wondering what they are doing now and stumbled upon your blog again (first stumbled upon it some time ago). Anyway, my purpose for writing is two-fold. First, in some ways, I am glad for some of your theological changes and emphasis, namely, a more sound view of grace. Although, honestly, I am not sure it is completely Biblical. I didn't save links and stuff, but I saw in a comments section a discussion you had, I think it was with J.M. where you enlisted certain verses to oppose his doctrines and said something like, "These verses contradict your interpretation." Have you thought the other way? Have you thought that the other verses contradict your interpretation, so you are the one that needs to repent (however you want to take the word?)? I don't want to be too harsh, but it seems that you haven't changed all that much from your days of "revivalism," although the teams have merely changed? I think your comments about Greg Gordon, D. Ravenhill, Dr Tozer, and many others are still in a similar vein. In response to this immediate article, I don't think the emphasis is that radically different. I've always heard repentance is "changing of the mind" and never associated merely with "pain and sorrow for sin." Never. Yet, would not "changing your mind" include ones sorrow for their sins? You change your view from rejoicing in your sin and boasting in it to being sorrowful? If anything, the view you are seeking to set forth is more conducive to "pain and sorrow for sin." Also, I wouldn't rule out grief as being an essential part of repentance. For example, if *I* was to write, "for godly grief produces a repentance that leads to salvation..." I have a hunch you would find it against the gospel and unevangelical. Fortunately, it is found in the Scriptures, so you'll either explain it away or claim another text that "contradicts it," as if the Scriptures can be divided. I. Point 1 is merely addressing "Repent and believe." Sure, we might be able to divvy them up nicely, but all point 1 is saying is that "repent and believe" is an evangelical grace, namely, a gift from God. Anti-nomians (which you may or may not be, I haven't spent enough time on your site) decried repentance. I assume, even with your definition of repentance, that you agree that it is to be preached by every minister of the Gospel, right? Do you believe that repentance and faith are a gift of God? If so, why is it it underlined and emphasized for disagreement? II. Re: don't your desire to change your mind on all things? Do you think one must change his mind all his understanding of establishing his own righteousness to the Gospel? If so, how is your view any different? If one spends his whole life and never changes his mind re: the Gospel, will they be saved? If not, how much of his mind does he have to change on the gospel? III. You think sinners can be pardoned without metanoia? V. Should we not endeavor to change on minds re: the Gospel? Should we be content doing this generally? Or ought we to change our mind's particularly? Are you writing this blog so men change their minds generally or particularly? If both, what is the difference? Just thought I would write, b/c I think you are close to some really good stuff and, honestly, it is quite refreshing that you've stepped away from the legalistic and Pelagian stuff of some of your friends (? ), but I believe your theology is being dictated more by your testimony rather than the testimony of Scripture. Also, I think some of your comments about other ministers, who to my knowledge are believers, is bordering on divisive and contentious. Finding this article was a blessing. I googled "metanoia greek christian" and found your blog immediately. The reason I was so interested in the great words meta and noia, is because I have been concerned why people confess their sins to make people feel better about themselves and take away their pain and guilt, as a temporary solution, but actually don't change. Then I realized even my KJV Thompson Chain Reference has fallen victim to the word repentance without mentioning metanoia. This has troubled me for some years, as it was clear something different was meant to be conveyed by Jesus Christ. Admittedly, this article is such a bombshell to me and answers questions I have had for decades, that I have not even finished reading the entire blog. Once done I will no doubt have more questions. Needless to say, this is definitely the reason the modern Christian church has lost its way today. I think the author is too kind to the Roman Catholic translators with the Latin Vulgate. If this essential aspect of christianity was suppressed as the book says, and the Reformation were blindsided to the real issue of order rather than the key word, then it goes a long way to explain the wishy-washy moral principles that are being espoused from our pulpits today, where congregation stay in their sin because they just changed their definition of righteousness rather than to decide to change their thinking and act in the right way. I will have more to add to this over time. A question, is this an actual excerpt from the book or is this Bro. Eli's own synopsis? Not being a theologian, I would not be able to engage in a deep philiosophical debate on this subject, but i can say the Holy Spirit led me to this site and I will follow His leading. Hello Michael, I'm so glad this was a help to you. This article is not an excerpt from Walden's book but is my own summary and thoughts on the book. Please read the book! It does a much better job of analyzing the Scriptures and the word metanoia than I have done! Hello I just read your article on repentance and have really been struggling with this concept. You are absolutely right that the necessity to turn from your sins is incompatible with salvation by faith alone. If Christ's call to repentance means to turn from sin, we have no more gospel. However, to answer your questions about those verses, it's important to see that metanoia always requires context to understand what the change of mind is about. In some contexts metanoia means to change one's mind/thinking again about our sinful behavior (such as the verses you quoted). The argument of Walden is that metanoia does not always mean that, and that the context of Christ's preaching shows that for Him it did not mean that, but that it was synonymous for believing the gospel. We need to always ask "change my mind about what?" The context will answer. Walden (and I) are against broad brushing both ways (interpreting every instance of metanoia as turning from sin or as believing the gospel). Metanoia is a rather hollow word that always requires its context to understand. Isaiah 59:20 essentially is saying that the Deliverer (Christ) will come and deliver those in Jacob who turn from "transgression" or "rebellion". When Paul points to this verse in Romans 11:26, he utilizes the Septuagint translation which has a slightly different take on this prophecy. Two things are different: the Deliver will come and 1) banish 2) ungodliness from Jacob. Which is it? Does Christ come and deliver those in Jacob who turn from transgression/ungodliness, or does Christ Himself do the work of banishing transgression/ungodliness from Jacob? The answer is: both. Christ will deliver those who turn, but it is also His own work of banishing that causes them to turn. Paul's free quotation is highlighting both aspects of that deliverance. Having said all that, I understand the rebellion/irreverence against God not to be the mere act of sinning against God, but rebellion against God's word and truth. God's word declares that the only kind of righteousness He accepts is the perfection of love, and that therefore all humankind are sinful, guilty and worthy of death. God's word further declares that in His Son Jesus Christ an atonement has been made and the everlasting righteousness that He requires has been provided, and that we must trust ourselves to this finished work of Christ alone in order to be saved. Those who refuse to believe that they are damnable sinners and will not trust in Christ are the rebellious/irreverent ones, and those who tremble at God's word, accept His verdict of their lives and trust in Christ alone for deliverance are those who are not rebellious/irreverent against God. Yes, everyone sins, and so in a sense all are rebellious/irreverent, but this verse is referring not to the universal sin of mankind, but to the rebellion/irreverence that refuses to accept guilt and humbly trust in another. Think of all the passages in the literature of John that talks about specific rebellion/irreverence. Thus I take Isaiah 59:20 to be referring to the banishing of unbelief in the gospel from Jacob, and also, those who turn to Christ from their rebellious unbelief will be delivered. Both aspects--the banishing and delivering--is the work of Christ. I'm asking us to think more deeply about rebellion than the mere act of sinning, but rather that deeper rebellion against God's truth that refuses to admit sin and believe in Christ. Amazing article! This should be required reading at every Christian college and university. Getting the correct definitions of biblical words is extremely important. If we don't, we teach false doctrine and are found liars before God.
' Repent ye ! ' Here again the true and splendid meaning of the word has been distorted. The word Mark uses, Meravoetre, is badly rendered by peenitemini or repent ye. Its true meaning is mutatio mentis, which signifies the changing of the heart, the transformation of the soul. Metamorphosis means a change of form, metanoia a change of spirit. The sense would be rendered better by conversion, which means the renewal of the inner man ; but the idea conveyed by ' repentance ' and ' penance ' is already an application of the words of Jesus, a commentary upon them. GIOVANNI PAPINI, "THE STORY OF CHRIST"
It is true that Jesus added "repent," but the old word has been distorted from its true and magnificent meaning. The word of Mark — Meravoetre — should not be translated "repent"; metanoia means rather the changing of the mind, the transformation of the soul. Metamorphosis is a change of form; "metanoia," a changing of the spirit. It ought rather to be translated "conversion," that is, the renewing of the inner life of man. The idea of "repentance" is only an illustration of Christ's command. GIOVANNI PAPINI, "LIFE OF CHRIST"
People always allow our enemy to take control of an issue, and this time (sadly), its no different. The word "repent" here was translated (until the "new" version of the catholic bible), as "do penance," but it was condemned by so many scholars as inaccurate that they were forced to change it to the true meaning "repent." The answer as to whether scripture is speaking of "repenting" or "do penance" should be obvious even to a new believer as shown in the parable of the prodigal son: Luke 15:7b...there will be more joy in heaven over one sinner who repents than over ninety-nine righteous persons who need no repentance. This is a perfect example of mans situation & not in line w/Roman teaching of penance. 1st: "He came to himself/reason"
2nd: "He wisely analyzed his situation"
3rd: "He came up w/reasoned a plan"
Anyway, I just want to back to Christ's statement: "there will be more joy in heaven over one sinner who repents, more than over the 99 just people who have no need to repent." All of this joy was brought about by the sons decision to "REPENT" & to tell his father I have sinned against heaven & you. The idea that "penance" is the main theme in the sons heart in basically....nonsense. Its a mere $$ maker to fill the coffers and its been doing just that for centuries. I'm sorry for being so blunt. Christ wants us to "REPENT"...change our ways, not to start doing penance. Theres a place for that AFTER we repent. I speak greek & it's my first language para means instead of not "besides"
Thank you for that correction, Greek. This is excellent and makes complete sense! Thank you!